The world is seeing a major transformation in the way people buy and consume food. The modern consumer is less likely to cook and more likely to order pizza, pasta, or a vegan salad from a nearby restaurant while sitting at home and watching House of Cards on Netflix. The current focus on convenience has created strong demand for web-based and mobile on-demand food delivery services. Customers are shifting from traditional phone-based ordering services to online platforms that allow them to order a wide range of cuisines from many restaurants all within one app or website. These on-demand delivery services also offer ratings and reviews of restaurants, and allow customers to pay with a single tap on their smartphones and tablets. Popular restaurant and groceries delivery startups such as Postmates, Munchery, Deliveroo, Foodora, and others have quickly reached high valuations (as of 2016: Postmates, ~$600 million; Munchery, ~$300 million, Deliveroo, ~$1 billion, Foodora, ~$4 billion), encouraging other venturers to enter the market and try to repeat their success. As of today, 39 US-based private food companies with $5 million or more in funding are trying to follow the same business model for delivering either prepared meals or fresh ingredients for home cooking. 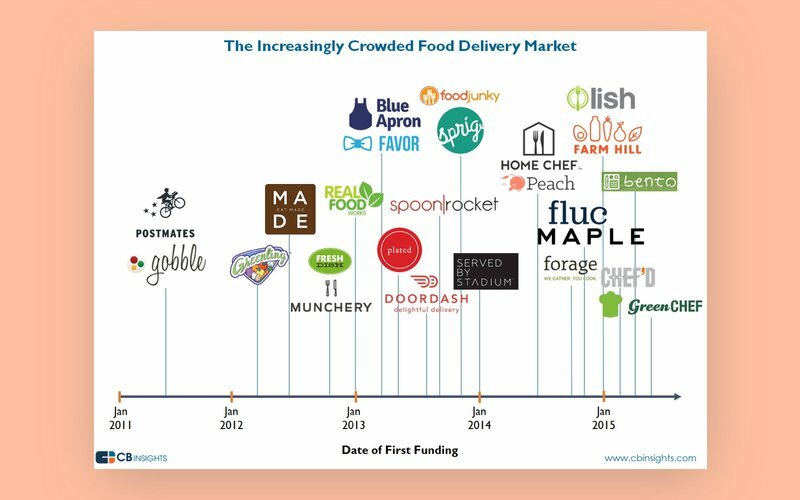 But while these food startups have attracted a great deal of attention from users and investors and have high valuations, it’s unclear what the future holds for the whole food delivery sector in general. We’ve compared three of the most popular business models adopted by present-day takeaway delivery startups to figure out which business model has the greatest potential to win in this rapidly changing online food delivery race. Ready, steady, go! The traditional model of food delivery looks like this: customers place orders over the phone with local restaurants and wait for a restaurant courier to deliver the food to their doorstep. Pizza has long been the most common type of food to order using this traditional delivery model. But as we’ve seen in every other sector, the rise of digital technologies is changing the food market rapidly. Modern customers, accustomed to shopping online via mobile apps and websites with maximum convenience and minimum human interaction, now expect a similar experience when ordering meals. Restaurants that provide their own takeout services have to catch up with the times by offering mobile food ordering options just to retain customers. The so-called “digitalization” of food ordering allows for fast delivery of takeout food with no (or at least little) real human interaction. 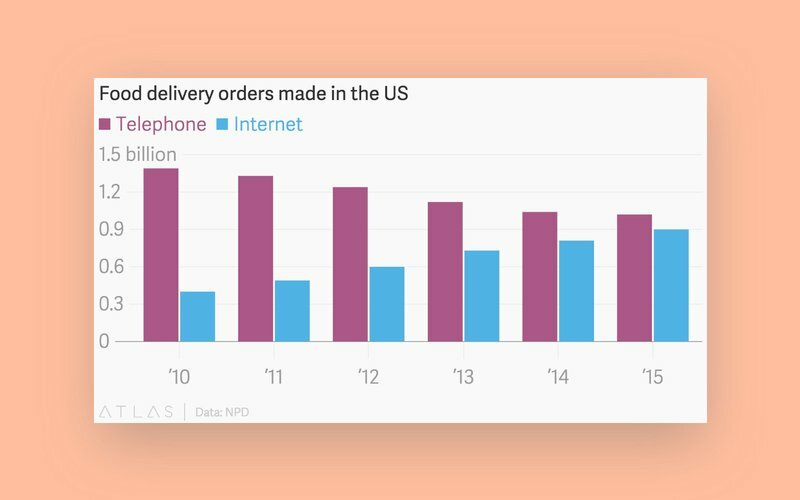 Famous pizza chains like Domino’s, Papa John’s, and Pizza Hut have been investing heavily in digital ordering services for years. These pizza giants have developed ordering systems for smartwatches, connected cars, and even gaming consoles. In 2016, Domino’s introduced its “zero-click ordering” standalone smartphone app as an extension to the “AnyWare” ordering service. According to Domino’s, using the Zero Click App you can really order a pizza without any taps in the app: after downloading the application, a user links their Domino’s profile; then, once the app is opened, a saved easy order will be placed automatically without a single tap or swipe. Accounting for accidental app opens, a 10-second countdown that starts when the app is opened gives users a chance to cancel their orders before they’re placed. During its first-quarter earnings call in 2016, Domino’s indicated that 55 percent of its total sales had come through online orders, and 60 percent of those digital transactions had been made via mobile devices. Pizza Hut also stated that online sales made up around half of its total transactions in 2016. 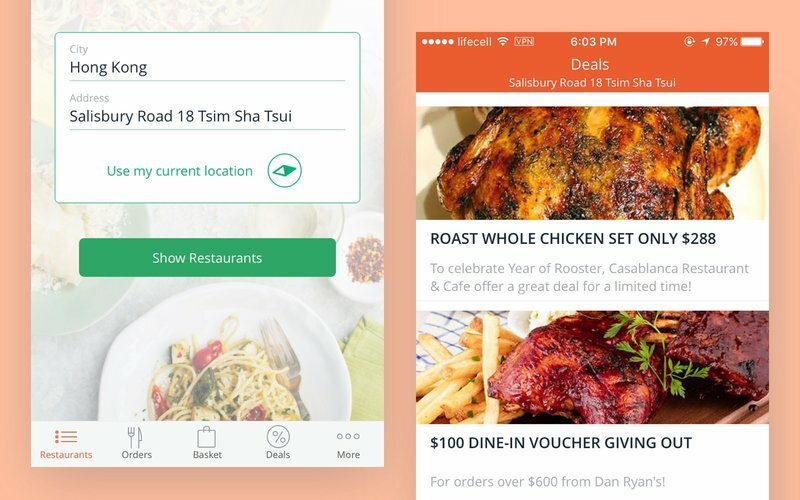 An aggregator, built on top of the traditional food delivery model, works as a mediator between a customer and numerous local restaurants, offering access to various cuisines through a single website or smartphone application. As you might have already guessed, the main focus of aggregators is on facilitating and providing customer support for orders. So how exactly do food delivery aggregators work? Once signed into a website or an application, users can easily check out and compare menus, prices, reviews, and ratings, and then place an order. Once an order is confirmed, an aggregator passes the order to the restaurant, and the actual delivery is handled by that restaurant’s own couriers. Aggregators collect a fixed fee for orders placed via their service; this fee is typically paid by participating restaurants, so there are no additional costs to the customer. There are at least four big players in the field of food delivery aggregators – Delivery Hero (Germany-based), Just Eat (UK-based), and GrubHub (US-based). These services have each achieved an international scale, and provide their services in distant corners of the world. For the time being, order-focused aggregator platforms seem to hold the strongest position in the food delivery market. GrubHub and Eat24, for example, controlled a combined 66 percent of the whole food delivery market in 2015. In 2017, Grubhub had acquaired Eat24. 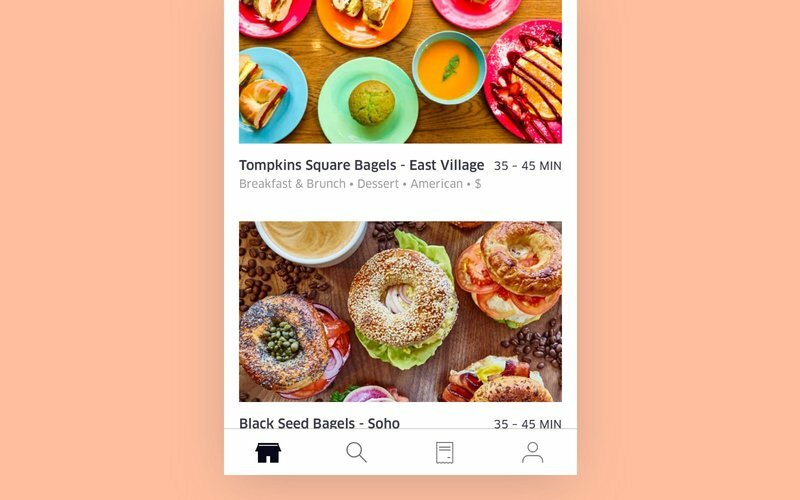 Just as aggregators do, new food delivery platforms allow users to compare menus across restaurants and order from a variety of restaurants through a single web or mobile app. But in addition to aggregating orders, so-called ‘new delivery’ platforms also provide logistics to partnering restaurants. By providing logistics services, these new food delivery platforms open new horizons to new upmarket restaurants that have never delivered meals on their own. For restaurants, a partnership with this type of platform can be very beneficial, allowing them to offer convenient delivery without having to worry about paying drivers, covering the costs of vehicle maintenance, and shelling out for insurance policies. Restaurants can instead focus on more important things, such as improving their customer service. To cover the cost of the delivery service, new delivery players charge both a restaurant and a customer a fixed margin for each order. You might be thinking: “Is this margin enough to keep the whole business with numerous delivery couriers and vehicles going?” Your skepticism is quite understandable. But despite high marginal costs, new delivery platforms have achieved high Earnings Before Interest, Taxes, Depreciation, and Amortization (EBITDA) margins (more than 30 percent). These margins allow them to keep their heads above the water. Plus, the more restaurants join a platform, the better it does. Services like Postmates, UberEATS, and Caviar now provide delivery services for restaurants that don’t run their own. These on-demand services widen the choices available to consumers, making it possible to order elegant and healthy options like foie gras or a garden-fresh salad instead of just pizza or Chinese food. In 2014, these new delivery companies handled orders totaling over $400 million. McKinsey believes that the addressable market for new delivery may reach more than €20 billion by 2025. Full-service on-demand delivery startups may truly be called direct competitors to “big pizza.” Their aim is pretty clear – to make healthy food accessible to all (and as quickly as possible). Unlike aggregators and new delivery platforms, full-service on-demand delivery startups don’t work with any third-parties (i.e. restaurants), but instead have their own chefs who prepare everything in-house. These platforms also hire in-staff couriers to deliver their meals to customers. So how do full-service food delivery platforms work? 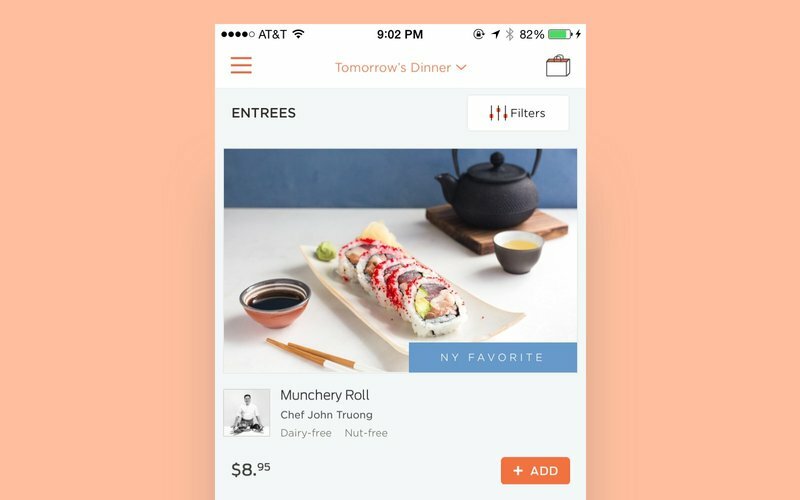 Munchery, the most popular full-stack takeout solution in the US, is a typical example. With Munchery, you can look at the daily menu and order a meal to be delivered within an hour-long delivery window (say, from 5 p.m. to 6 p.m.). You can even schedule orders for the next day if you like to plan that far ahead. To make ordering easy, each dish on the menu includes a photo and a list of ingredients, as well as a name of the chef who will cook it. You can also check reviews other customers have left about each meal and directly message a chef. One surprising thing about Munchery is that your food arrives cold intentionally, but comes with heating and serving instructions. Previously, Munchery cooked and delivered pre-ordered dinners in San Francisco, Seattle, New York, and Los Angeles. In late 2016, the company expanded their service to include lunches as well. Since October 2016, Munchery has been serving lunch to companies who sign up for corporate accounts. Offering corporate accounts is a really nice move if you want to grow your food delivery business. By providing a full-stack food delivery service, you have absolute control over the customer experience. You can ensure that you serve your customers fresh and tasty food and that their orders are delivered without any delays, since your own in-house chefs and delivery drivers are responsible for the process. Combine this level of control with reviews and ratings, and you have endless potential to further improve your services. But there are some drawbacks to such a full-stack business model. For starters, a full-service meal delivery business requires a substantial amount of initial funding. You’ll also need to pay salaries to many employees and maintain lots of equipment. Add to that various insurances and different certifications for your business to comply with laws and sanitary standards. The idea of building a business with minimal expenses for salaries and equipment maintenance – the aggregator model – may entice a nascent entrepreneur. In reality, however, launching an aggregator food ordering and delivery platform may be harder than you think, first and foremost because of the massive competition in the market. To date, GrubHub, a clear industry leader, has partnered with more than 50,000 takeout restaurants in more than 1,100 cities in the US (plus London). For a small company just entering the market, it would be rather hard to outdo this giant. GrubHub’s portfolio of brands, i.e. the list of startups that have already merged with the company, now numbers as many as six, including Seamless, MenuPages, and Allmenus. Another difficulty of launching a food delivery service is limited market growth opportunity. Of course, for partnering restaurants that have their own logistical manpower, joining an aggregator platform will be a great opportunity to set increase their presence without pouring a huge amount of money into developing your own online portal. But what about those restaurants that don’t deliver on their own? New delivery services offer to extend delivery services to a new group of restaurants and consumers. Partnering with restaurants that haven’t delivered before, new delivery services expand the overall availability of food delivery on the market. It’s also possible that in the near future, even those restaurants that deliver food on their own may start relying on new delivery players since outsourcing logistics can be cost efficient. At Yalantis, we believe that new delivery services offer the most benefits to all parties involved – partnering restaurants, customers, and the delivery service startup itself. For restaurants, this new delivery model provides a chance to enlarge their current user base, as well as the chance to better utilize existing kitchen facilities. This all may eventually result in much higher revenue and further business growth. Besides, new platforms offer free marketing and logistics networks for restaurants that couldn’t deliver on their own previously. For customers, advantages of new delivery services include promptness, convenience, and selection. The choice of numerous cuisines is especially appealing for those who are sick and tired of pizza and sushi. For delivery services, working with larger, established restaurants (from Masa to Chick-fil-A) offers an opportunity to achieve a higher average order size than aggregators can. It also offers a chance to control the whole customer experience. For example, you might integrate some sort of curation process to allow only the best restaurants to be featured on your platform. As for the rest of your platform’s appeal, you can delight your customers with the fastest and most convenient delivery ever. Designing and developing apps for the Brilliant Move Inc.'s customers and delivery teams, and a backend with an admin panel for its managers.